This is your go-to knife for prep work and will help you get fast, professional results. Slice fruits and vegetables, cut corn off the cob and trim fat from steaks, chops and roasts. 4-7/8" Double-D®-edge blade. The Cutco Trimmer will be a major player in your kitchen. Handle material: Highly engineered thermo-resin. Clips securely to the knife for safe and convenient storage. Perfect if you keep your knife stored in the drawer instead of a block! 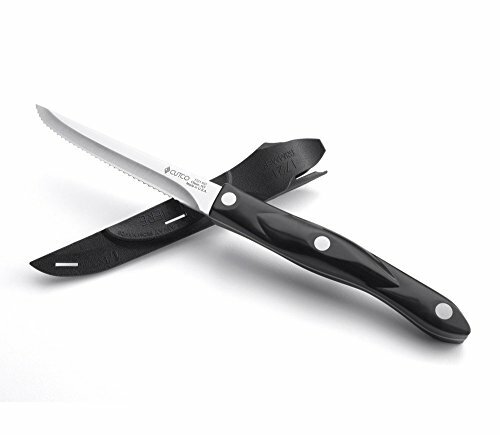 Exclusive Double-D® edge The Double-D® edge provides a clean, smooth cut every time and stays sharp longer than straight-edge knives. Can be factory sharpened. Ergonomic handle Universal fit for large or small, left or right hands. Thumb and forefinger lock into place for safety and control. Fatigue-resistant design. Full tang Blade extends full length of the handle for extra strength and balance. Guaranteed Forever Like all CUTCO products, the Trimmer is guaranteed forever.